A maple syrup contest from purecanadamaple.com got me thinking of a recipe including both maple syrup and beer. The above (recipe below) is what I came up with. I hope you enjoy! 3. While oven is preheating, make the maple chipotle glaze by adding a couple of chipotle peppers w/ adobo sauce and a whole bottle of pure maple syrup to a blender. Add a pinch of salt and blend until smooth. 6. In a large cast iron skillet brush olive oil on bottom. Add chicken breasts with potatoes and carrots on either side. Add potatoes and carrots on bottom of plate. Place glazed chicken breast on top. 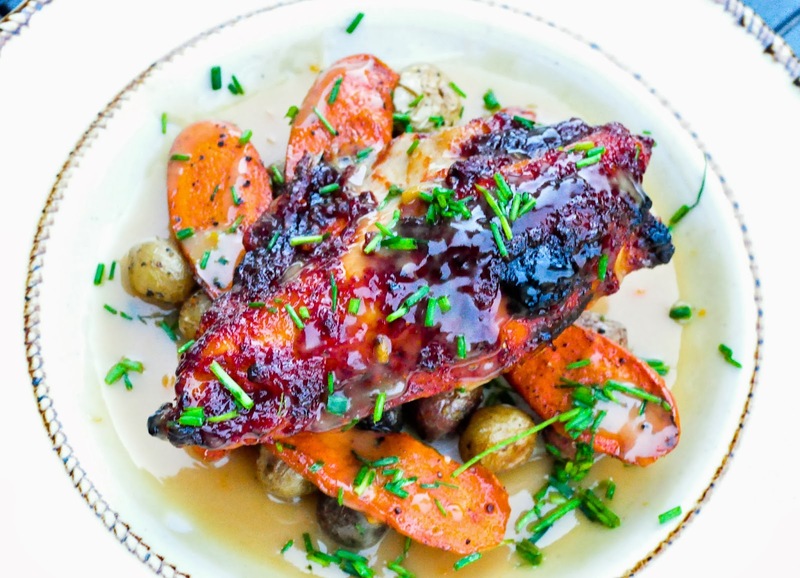 Pour sauce over chicken and around carrots and potatoes. Top with chopped chives. The sweet and spicy glaze on the chicken pairs so perfectly with the sauce and beer you might just fall out of your chair. Pair with Revolver Blood & Honey (of course! ).